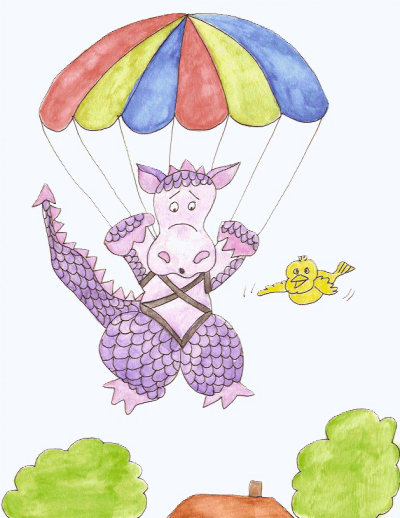 Ichabod, the purple dragon, had lawys wanted to go skydiving. Even though he had wings and could fly anywhere he wanted, he wanted to jump from an airplane and soar through the sky, popping open his parachute and falling gently to the ground. A man heard about Ichabod's unusual request and went to the dragon's cave. "Ichabod, I hear you want to jump from an airplane and parachute to the ground." Ichabod yawned and when he saw the man, he walked out of the cave. "Yes, I'd love to do that. Will you take me up?" The man said, "Sure. Why don't you come in my airplane right now and we'll go up. It's a nice day with little or no wind. You'll be safe." Ichabod smiled and followed the man. The dragon climbed inside the airplane and strapped himself into the chair while the plane taxied down the runway. It took off and Ichabod looked down at the ground. After they'd gone up high enough, the man came back to Ichabod. "We're ready. Put on your parachute and go to the door. When I say to jump, you should jump." Ichabod put his parachute on and buckled it up. He tugged it to make sure it was tight and secure. "I'm going to jump from this airplane." But when the door opened and Ichabod saw how high up he was, the dragon changed his mind. "Uh, um, I don't think I want to do this. Look how high up we are. What if my parachute doesn't open? What if I die when I hit the ground?" The man laughed. "Don't be so worried. Just jump." Ichabod stood at the door. The wind blew and he took a step back. "I can't do it. I just can't." He ran back to the chair and sat. The man went up to the cockpit and took the plane back down. "If you want to try again tomorrow, just come over here and we'll try again." Ichabod went home and thought about it all night. The next day he went to try again, but as soon as that door opened, he changed his mind. It went like this for ten days. Ichabod decided he would never be brave enough. One day a yellow bird flew into Ichabod's cave. "Ichabod, I heard about your fear of sky diving. Why are you afraid?" The dragon sighed. "What if the parachute doesn't open and I smash into the ground?" "Don't be so silly," said the bird. "You're a dragon. You can fly. If the parachute doesn't open, just use your wings." Ichabod's eyes opened wide. "You're right!" He marched over to the airport and the man took him up in the plane. When they got high enough the door opened. Ichabod laughed and jumped out of the door. He fell through the sky and opened his parachute. "Whee! This is fun!" He fell like a feather. "This is fun!" The bird flew up to Ichabod and whistled. "You're doing great, Ichabod. You did it! You did it!" "I certainly did." The dragon landed with a soft thud. He looked up at the airplane and smiled. "I did it."